After three years as the head coach at Champagnat (Hialeah), Dennis Marroquin has hung the whistle up to pursue an entrepreneurial opportunity. The Lions are just over a month removed from a win over University Christian (Jacksonville) in the Class 2A State Championship game in Orlando. Marroquin, who made the announcement official on Twitter on Monday, stated that he is not coaching anywhere in 201 giving the rest of his staff to continue building the legacy that he set forth when he took over in 2015. As such, Marroquin’s replacement was already on the staff with Hector Clavijo III accepting the appointment of the position which he officially announced Monday afternoon on Twitter. I am Proud to announce that I will be accepting the position as HEAD COACH of the Defending State Champion CHAMPAGNAT CATHOLIC LIONS. Thank you to the parents, kids, administration, and staff for your support of making this move. 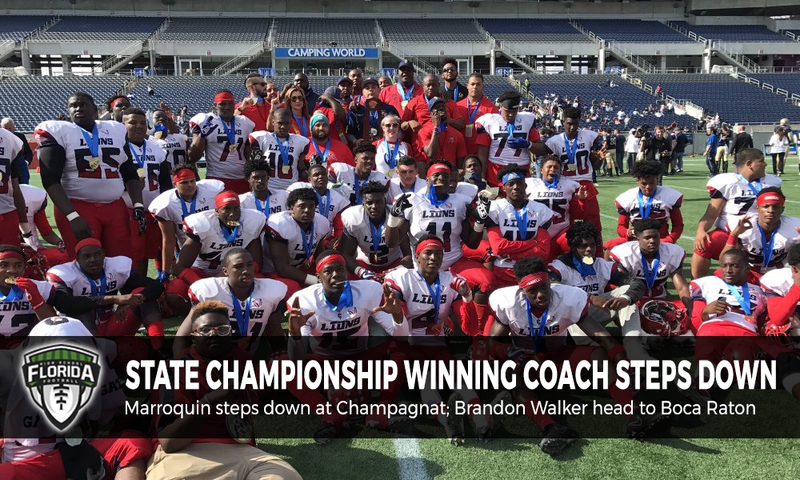 Champagnat is set to have a tougher schedule this fall with the apparent announcement that they would travel to Class 3A state runner-up Oxbridge Academy in September, per Wells Dusenberry at the South Florida Sun-Sentinel. It didn’t take long for Brandon Walker to find another head coaching job after stepping down at the end of the season from the same position at Cooper City. Walker spent the last five seasons with the Cowboys compiling a 23-28 record, according to Wells Dusenberry at the South Florida Sun-Sentinel. The son of the legendary Byron Walker who is the current head coach at Archbishop McCarthy (Southwest Ranches), stood out in a field of 45 applicants to replace Eric Davis who stepped down after the season after leading the Bobcats for four seasons. This will be Walker’s third head coaching job with his first coming with Somerset Academy (Pembroke Pines) from 2011 until 2012.